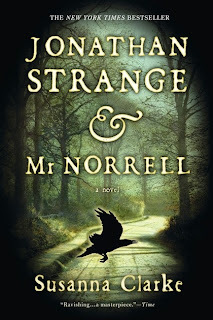 I've wanted to reread Jonathan Strange and Mr. Norrell, well, pretty much since I first read it (probably in 2004 or 2005 when it was still new). I have to admit I was a bit nervous though because many readers through the years have decided they couldn't get through it, with its copious footnotes and details. I thought maybe my memories of it were more glowing than the book itself. But, the new BBC miniseries prompted me to get to it now and, though it admittedly took me a couple of weeks to get through it, I enjoyed it again just as much as I remembered having done the first time. It is a glorious novel that builds an entirely believable hidden world of magic, just out of focus from our own world. The seven-episode miniseries has begun airing this week in the UK and will show on BBC America in the US starting on June 13. In February 2004, to my perplexity and my delight, the mail brought an advance, but finished, copy of Jonathan Strange & Mr Norrell. I took my daughters on holiday to the Cayman Islands, and while they romped and swam in the surf, I was hundreds of years and thousands of miles away, in Regency York and in London and on the continent, experiencing nothing but the purest pleasure, wandering through the words and the things they brought with them, and eventually noticing that the paths and lanes of the story, with its footnotes and its fine phrases, had become a huge road, and it was taking me with it: 782 pages, and I enjoyed every page, and when the book was done I could happily have read 782 more. I loved the things she said and the things she did not say. Perhaps some of you that didn't get through the novel will feel inspired to pick it up again after the miniseries. It's getting favorable reviews claiming that it is true to the book, something that we all hope for every time we see an adaptation being made. 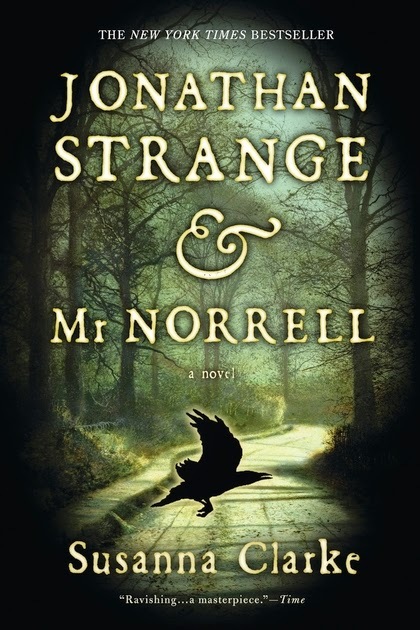 And perhaps others of you will do as I did and pick up your already beloved copy again and disappear into the world of magician Jonathan Strange and his mentor, Mr. Norrell. Why not indeed? ;) I'm glad you got through it though! I didn't get through it years ago (actually, didn't get beyond a few pages), but listening to the audiobook this January was amazing! I didn't think the footnotes were difficult or anything. They were funny! :D I'm very much looking forward to the mini-series. 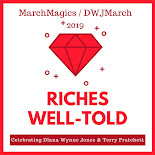 I tend to choose shorter audiobooks since I don't get much time to listen to them but I might listen to a little of this one just to see what it is like. As I think I mentioned before, I love this book! Do I have time to reread it and read Anna Karenina this summer (one of my goals)? It might have to wait till next winter. I finally got around to reading it in January and I absolutely loved it! I particularly enjoyed the footnotes which I found hilarious. I understand it's not for everyone -- the length IS daunting and if you're not used to the 19th century style of writing, it could seem rather dry. I'm anxiously awaiting the miniseries in June -- and hopefully, a sequel someday! The length is definitely daunting but also, this time through at least, I never thought there was anything there that didn't need to be. The pacing is really nice! And a sequel would, of course, be fantastic. In the meantime, I'll reread The Ladies of Grace Adieu later this year! I so want to watch the miniseries, and I'm trying not to get my hopes up too high for it. The book is one of my favorites ever, and despite its extreme length I reread it at least once every few years (I have a box set of three paperbacks? which makes for easier rereading). Such an awesome book. I wish she'd write another. I'm trying not to get my hopes up either but it does help to hear good things about it so far! And I'm happy to say that I'm keeping the book on my favorites list (I always wonder when it's been too long since I last read it)! After reading Clarke's short story collection, I've been itching to pick this one up again myself! I think I may try it on audiobook, though I haven't really been doing well with audiobooks lately. I just can't imagine how long the audiobook would take me to get through! It might be good for a reread though because you aren't expecting to rush through it or anything. I hope you do get to some sort of reread though. It really is satisfying to revisit! I started this on audiobook a few years ago and didn't get through it - I think the combination of text and footnotes just didn't work for me. I have a physical copy now - really should try to get to this one soon.